Conductive inkjet printing are commonly used by inexperienced users such as graphical designers, students, and children to make a lot of interactive applications with electronic circuits. However, though these beginners wish to focus on creative and aesthetic aspect while making such circuits, current technology forces them to think about complicated electrical behaviors of the circuits, which is discouraging. One of those problems is to light up multiple LEDs given the non-negligible resistance of the conductive ink. 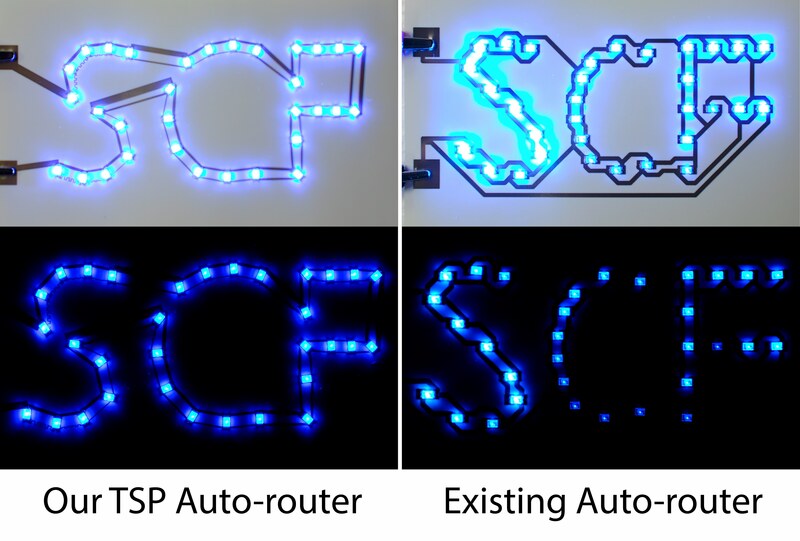 We propose a Travelling Salesman Problem based algorithm to automatically generate an optimal path to connect all the LEDs to a power source and adjust resistance of the conductive traces printed by the conductive ink to assure that all the LEDs light up evenly.